British horror films of the 60s and 70s tend to fall into two categories: The good and the swinging. 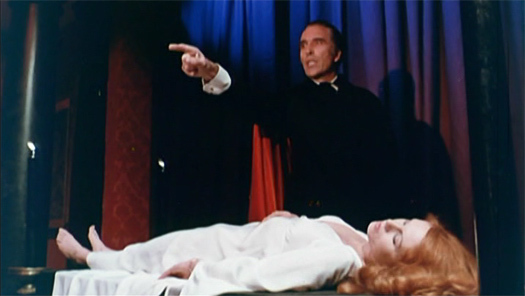 Count Dracula and His Vampire Bride was an attempt by Hammer Studios to bring the vampire legend into the modern age. While the modern age for early to mid-70s horror films often consisted entirely of mini-skirts, floppy-haired-heroes and a swinging jazz score, Count Dracula and His Vampire Bride, also known as The Satanic Rites of Dracula, offers a bit more. The film opens on a satanic ritual being conducted in a sprawling manor in the English countryside, where the hooded participants are preparing to sacrifice a young girl. “Thus, by the 6000 terrors of Hell are you anointed,” the girl is informed--which by some standards is pretty flattering. Most sacrificial virgins are lucky if they’re anointed by two or three thousand terrors; very few ever receive the full six thousand treatment. Meanwhile, a badly wounded man who had infiltrated the cult but whose true identity as a secret service agent had been discovered, escapes from the manor. His superiors bring him back to the headquarters, which is full of sophisticated, high-tech equipment like reel-to-reels, slide projectors and the obligatory wall-sized computers with blinking lights. Yet the contrast between the primitive ritual we’ve just witnessed and the then-modern technology is quite striking. It’s almost eerie, in fact, to think the supernatural could creep into the modern world so easily, a motif that will return throughout the film. “Tell me more about this ritual,” one of the agent’s superiors demands. “They seem to take strength from their own blasphemy,” the agent mutters. Luckily, he had managed to take photos of four of the cult members, who all turn out to be influential members of British society--a government minister, a peer, a general and a famous scientist. To help them tackle the cult, the secret service brings in floppy-haired Inspector Murray (Michael Coles) from Scotland Yard, who recommends they contact Professor Mortimer Van Helsing, played by the great Peter Cushing. “He really knows about the occult, the black arts and. . .,” Murrary says of Van Helsing with an ominous ellipses. “And what?” says one of the agents. “Other things,” Murray replies cryptically. As it turns out, Van Helsing knows the famous scientist in the cult, Julian Keeley (Freddie Jones), and decides to pay him a visit. He finds Keeley working on a mysterious formula and babbling to himself. “Evil rules. Evil and violence are the only two things that hold any real power,” he’s saying, completely failing to hide his cult-member status. From there, the film takes off, as Van Helsing discovers his old nemesis Count Dracula (Christopher Lee) is behind the cult and that the mysterious formula is a new, deadly strain of bubonic plague, with which the Count plans to wipe out the human race. “With only disease and dead bodies to feed on surely the vampire himself would perish,” Inspector Murray says to Van Helsing. 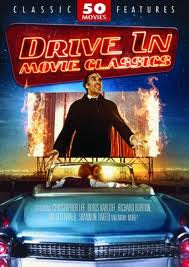 It’s a disturbing, psychoanalytical take on Dracula that fits right in with the dark, paranoia-tinged tone of the film. There's an ever-present feeling of dread in Count Dracula and His Vampire Bride, a distrust of government, and an end-of-the-60s vibe that calls to mind films as disparate as Night of the Living Dead, Easy Rider and The Parallax View. In other words, the movie brings the vampire legend into the modern age--and it does so with minimal mini-skirts and go-go boots. Any thoughts on this gem? Where does it fit in the Hammer horror canon? Is this one liked by fans? Favorite Dracula? Favorite Blacula? I actually rather like the film, but I think a great deal of that might be because I haven't seen any of the other Hammer Draculas (at least, not since Creature Double Feature was on the air mid-Saturdays.) I can imagine that many fans of the day didn't want to see the difference being split between Dracula-as-Gothic-terror and Dracula-as-Bond-villain. Coming at the movie already knowing it by reputation, and not particularly feeling that it "should have" upheld a particular legacy of Hammer Dracula films, I found it quite pleasant and even memorable in spots. That ending, though, has gotta go. I won't spoil it for those who might watch it later, but holy cow! I'd rather have had a literal deus ex machina ending where Dracula was defeated by the sudden intervention of God Himself than the lame ending the movie actually gave us. That's a great way of putting it. I didn't come to this movie with too many expectations, either, so I was a bit more surprised and pleased than many die hard Hammer fans seem to be. I rather enjoy it when franchises go a little off the rails, as the Dracula series did here. I didn't actually pick up on the Bond influence the first time around, but now I definitely see it.